What’s included in the DJ price? The DJ price includes: up to five hours of service, the DJ’s entire sound system, wireless microphone, basic dance floor lighting, access to our online planning forms and a planning meeting with your selected DJ. Are DJs priced by the hour? The DJs are not priced by the hour, but a flat rate for the evening up to 6 hours. Overtime is $150 per hour, after 6 hours. Is there tax or service charge? There is no service charge on any of our services. Rentals and Videography are our only taxable items. What is the difference between the halo and the infinity booth? The halo booth is more compact with a lower resolution picture and has texting capabilities (7 Megapixel). The infinity booth can take higher quality photos (DSLR HD Photos) and can do a slow motion effect. Both have the ability to do green screen and to email photos. Our booking fee is a non-refundable $500 payment that goes towards your final balance. The remaining balance is due 30 days prior to your event date. We do not offer payment plans, however, if you would like to create your own, you can absolutely do that! You would simply email our Office Manager at sarah@leforcedfw.com when you are ready to make partial payments and she will send invoices. What happens if my DJ can’t make it to the event? This is a very rare scenario. However, if an emergency arises and your selected DJ is unavailable for your event we will assign our next best available DJ to your event. If it is the day of, we have an on-call DJ every Saturday. Do we get a meeting with our selected DJ? Yes! You get a planning meeting with your selected DJ typically about 4-6 weeks prior to your event date. Does the DJ act as an MC (Master of Ceremonies) as well? Absolutely! All of our DJ are trained not only to be an excellent DJ, but also to be a great MC. Unless otherwise specified with the client, the DJs will typically wear suit and tie, but will never out dress the groom. What is the usual set up time needed? Standard set up time is usually 2-3 hours. This gives us plenty of time to do our set up, sound check and make sure everything is in perfect working condition before guest arrival. Are there any travel fees? There are only travel fees for venues that are more than 60 miles away from LeForce Headquarters (9140 Premier Row Dallas, TX 75247). Any event at a venue over 60 miles from our headquarters will have an additional fee of .50 cents/mile round trip. Any event at a venue over 100 miles from our headquarters will have the .50 cents/mile round trip fee, as well as a $100 hotel fee. Are you willing to play songs that are not in your collection? If so, will you obtain the songs or must we provide them? 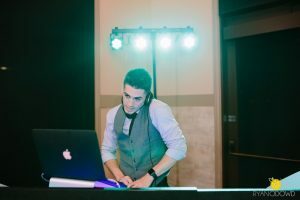 Our DJs will play any songs that you would like at your event. They each have an extensive library, but if they do not have a song that you have requested, they will obtain it for you at no additional charge. Do you require vendor meals? No. We do not require vendor meals, however, the DJs are always grateful if you decide to provide it! DJ tip is not included in their price and is not required, but is appreciated! Will you honor requests of songs that must not be played? Absolutely! In the planning forms there is a “do not play” section that the client has final say over. What do we and/or the facility need to provide for you? The facility will need to provide one 20 amp circuit. We also prefer that the venue will provide one 6ft banquet table. However, if they cannot, we will supply our own. What lighting, if any, do you provide? The only lighting that the DJ comes with is basic dance floor lighting. However, if you’d like to add additional lighting, we are more than happy to offer you one of our other lighting packages! Please find a picture below of the basic dance floor lighting.